Thirty years ago, two personal computers would dominate the UK’s video gaming market. Games were loaded from these two machines with a tape deck or – if you had money to burn – a disc drive, or a solid state cartridge. In the United Kingdom, its biggest selling micro was the Sinclair ZX Spectrum. Second in Britain, though the biggest selling personal computer of all time, was the Commodore 64. Many a playground battle would see boys shouting the odds as to whether the Speccy or the Commie was the better machine. One would be laughed at for saying ‘the Tatung Einstein was the best thing since sliced bread’. With this next paragraph, I shan’t reignite that debate, but the truth was both machines had their shortcomings. With the ZX Spectrum, attribute colour clash, no hardware sprites and weedy sound (sorted out in 1985 with a 3 channel sound chip on its 128k models), though great 3D graphics. As for the Commodore 64, it was mind numbingly slow at 3D graphics (though Geoff Crammond’s Stunt Car Racer proved many a C64er wrong), but it did sprites (eight Movable Object Blocks to be exact, and using Commodore’s terms) and three channel sound. A custom chip, known as the SID chip would be its strongest asset. Thirty years on, the Sound Interface Device (SID of course, in long hand form by the way) still packs a punch today. Even the creator of this blog listens to the odd Rob Hubbard or Martin Galway composition along with Supertramp and Half Man Half Biscuit. It defined – and added to the popularity of a personal computer which whose innards were originally for arcade machines. It is only fair that on the C64’s 30th birthday we should do a round up of East of the M60‘s greatest Commodore 64 musicians. The most famous C64 musician of them all! Hull born Rob Hubbard composed many a tune for the Commie’s vibrant budget games scene as well as some full price titles. Whilst working with Gremlin Graphics in Sheffield, he created what is often seen as his most celebrated tune: the in-game music to Monty on the Run in 1985. Other notable works included theme music for Mastertronic’s and Firebird’s budget games (One Man and His Droid and Warhawk) and System 3’s International Karate and IK+. In recent times, he has composed music for mobile phone gamers. Second only to Rob, many a C64 owner would recognise the dulcet tones of Martin Galway. Most of his sonics were done for Ocean and Imagine software houses, with on many of their titles, the Ocean Loading Theme. His most esteemed work is the signature tune to Sensible Software’s Wizball, also published by Ocean Software in 1987. Arcade conversions were his forte with the themes for Arkanoid, Green Beret among his credits. The rather yawnsome Game Over (more famous for its sleazy advert than its playability) also had the Martin Galway treatment. Towards the Commodore 64’s commercial retirement, the late 1980s and early 1990s saw the barriers of the SID chip pushed even further. A new generation of musicians such as the Maniacs of Noise and this gentlemen pushed the ADSR envelope much further. Tim Follin’s most celebrated themes were for the Capcom arcade conversions Bionic Commando and Ghouls ‘n’ Ghosts. Like Rob Hubbard, he cut his teeth with Mastertronic before working with US Gold in the late 1980s and early 1990s. Psycho Pigs UXB (US Gold, 1988). 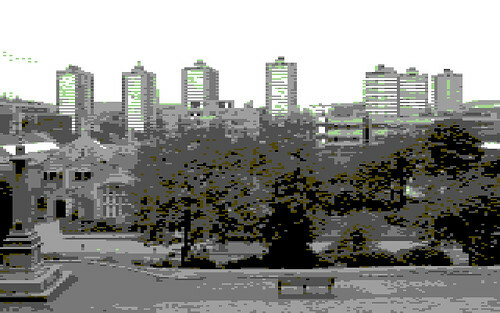 Just as prolific as – and also a fellow Northerner like Rob Hubbard, the sound of many a mid-1980s C64 game would been a Ben Daglish production. Most of his work were for Gremlin Graphics and US Gold, with his portfolio including music for the latter’s two Gauntlet conversions. With Gremlin, his work included Auf Wiedersehen Monty, Future Knight and Jack The Nipper. For many, his finest hour was the theme to System 3’s The Last Ninja. Super Cars (Gremlin Graphics, 1991). Towards the late 1980s, Martin Walker’s tunes were the soundtrack of many an action game, particularly shoot-em-ups and coin-op conversions. His most celebrated work was the in-game music for Thalamus Software’s Armalyte, hailed by many a C64 user as the machine’s finest shoot-em-up. Also equally revered was the in-game music for Citadel. Jeroen Tel is a founding member of The Maniacs of Noise whom, still to this day, compose in-game music for more contemporary systems and more besides. Formed in 1987, they quickly made a name for themselves on the Commodore 64. His musical scores for Turbo Outrun and Cybernoid gained them an avid following. A leit motif of their work was sampled speech, used to good effect on the intro music to Turbo Outrun, which more than made up for the hideous multiload on the tape version. Cutting his teeth with Rainbow Arts in the late 1980s, Mr Hülsbeck would always be synonymous with most C64ers for the Turrican signature theme. After working with Manfred Trenz on the C64 conversion of R-Type, they would work on the Turrican game together. Though not as prolific as Rob Hubbard nor Ben Daglish, he left us with some gems. A lot of people, without even owning a Commodore 64 would have come across a SID tune sometime ago in the UK singles chart. If you remember Kernkraft 400 by Zombie Nation, you would have come across this fellow’s work. Sampled in that piece is David Whittaker’s theme from Terminal Software’s Lazy Jones (1984). Almost from the start of its commercial life, he composed many a SID tune for budget and full price titles. He was quite prolific and did a lot of work for Mastertronic and Codemasters. With the latter software house, he composed the theme for numerous titles including BMX Simulator, which was their first major smash hit and the original Dizzy arcade adventure. Though not prolific, quality rather than quantity is true of Peter Clarke’s output, particularly with the seminal theme tune to Bubble Bobble. Even now, it remains infectious and in my case an occasional earworm. Repton 3 (Superior Software, 1987). For our tenth C64 SID maestro, we move on to one of the Commodore 64 community’s most revered double acts (well, one half of them to be exact). If you had a C64 in the early 1990s, the names Apex, or John and Steve Rowlands may ring a bell. They were responsible for the excellent Creatures, Creatures 2 and Mayhem in Monsterland platform games. Besides the lush graphics and twisted torture screens of the first two games, another part of the secret sauce was Steve’s sonic wizardry. On Mayhem in Monsterland, Happy and Sad themes were composed (after Mayhem completed the first level and brought daylight to Monsterland on the next stage). Glaring omissions? Memories of the ten musicians mentioned? Feel free to comment. Tell us about your favourite Commodore 64 music, whether from commercial or public domain games, or PD demos. Surely Matt Gray deserves a mention? Last Ninja 2? Bangkok Knights loader? Hunter’s Moon loader? All outstanding. Good shout with Matt Gray. I remember his theme tune for Driller among with the others. Seconded on his works for Thalamus Software and System 3. Great article – really enjoyed reading it. I was unaware of C64 music up until a few years ago. Now I love it – like you, I listen to the odd sid tune alongside more contemporary music (actually, it’s amazing how contemporary some SID music still feels, even after 30 years). Thanks for posting. Thank you for your comments. I had a Commodore 64 in the early 1990s, and thanks to the said machine, Rob Hubbard’s and Martin Galway’s work forms part of my playlist as much as Supertramp and Half Man Half Biscuit do. How I would have missed all this if my first machine was a ZX Spectrum. SID > BEEP + AY-3-8912 any day. Nice article. I was a C64 gamer myself and still listen to a fair bit of SID Music and C64 Remixes (courtesy of RKO and C64Audio.com). I personally never favoured Hubbard – I would have Galway, Tel and probably Follin ahead of him. Other notable absentees include (as above) Matt Gray (Last Ninja 2, Dominator, Quedex, Hunter’s Moon), Johannes Bjerregaard (Stormlord, Flimbo’s Quest) and, significantly, Jonathan Dunn (Robocop, Platoon, Operation Wolf, Ocean Loader 4). Reyn Ouwehand also deserves a mention for Flimbo, Last Ninja 3 & Last Ninja Remix. Would definitely have Dunn instead of Whittaker, who is probably more revered for his Amiga work. Nice to see the fabulous Martin Walker and Steve Rowlands acknowledged – the latter never really received the recognition he deserves. Many thanks for your comments. Matt Gray and Jonathan Dunn are most honourable mentions; I first came across his work when I loaded Dragon Ninja into my Datasette in my adolescent years. I forgot about Reyn Ouwehand, not least his involvement in the Maniacs of Noise along with Johannes Bjerregaard. For me, Martin Walker always meant the theme tune to Armalyte. I’m with you on the lack of recognition Steve Rowland has in the C64 scene. Along with brother John, they as Apex really tested the Commodore 64 but unfortunately, some users who remembered Rob Hubbard and Ben Daglish moved on to Amigas, consoles and PCs. For Martin Walker, the Armalyte Loader & Title themes stand supreme, but most of his work was excellent – check out Dominion, Citadel, SWIV, Snare, Time Machine and Ninja Spirit if you haven’t already. AAAhhh You missed the masterpiece Wally Bweben’s Tetris ! It’s hard to avoid leaving someone worthy out, considering the many amazing composers. Fred Gray, Jonathan Dunn, Neil Brennan and Richard Joseph would be present on any such list of mine. I almost forgot about (the late) Richard Joseph. For me, the first tunes I think of by Mr. Joseph is his music for Cauldron and Cauldron II. Such gloriously spooky sound effects too. There’s probably scope for another ten C64 musicians. In its commercial twilight years, we could consider Alistair Brimble before his move to the Amiga scene. Also Steve Barratt whose compositions were used in Fantasy World Dizzy and the awful conversion of Super Hang-On (which is spite of being like a pregnant slug was still faster than Hard Drivin’ on our favourite breadbox). His music was the best part of Super Hang-On.